Cold days always make me wanna have hot pot, then hot weather drives me to enjoy sour, sweet and spicy Thai cuisine. 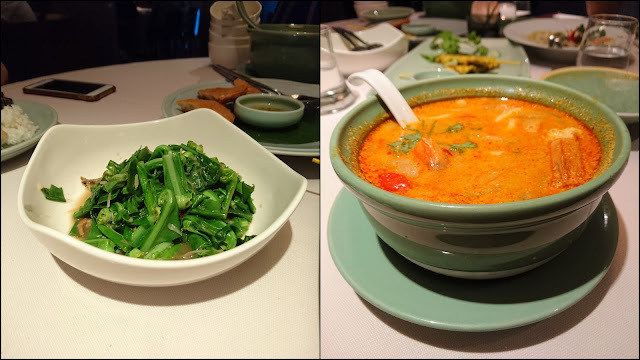 This time, I visited Soukhothai, the Thai cuisine restaurant on the second floor of Sheraton Grand Taipei Hotel. It’s seldom to see a Thai restaurant in a high-class hotel. So, Soukhothai is more expensive than others. However, the seats of Soukhothai are taken up by customers to 80% in lunchtime of the weekday. It’s really crazy! The atmosphere of Soukhothai is pretty good with texture. Each table is divided from others, and hard to disturb each other. As to service, it must be flawless due to Soukhothai belonging to Sheraton Grand Taipei Hotel. In order to compare if Soukhothai’s dishes are better than other Thai restaurants’ or not, I ordered the cuisines I’ve tasted before. In my opinion, undoubtedly, Soukhothai’s cuisine is great, but doesn’t overwhelm other Thai restaurants’. As a result, if you want to treat other people, then Soukhothai is the best choice. But, if you just want to enjoy yourself with friends, for ur money sake, you had better choose others, Lol.